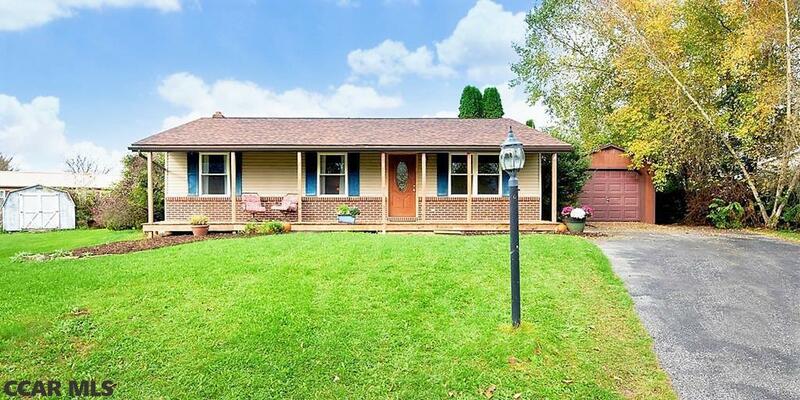 Home Looking for Owner of this Darling 3 Bedroom Ranch in Pleasant Hills. This cul-de-sac gem has an inviting full front porch with a mountain view. As you enter, you are greeted with a roomy living room, currently being used as an oversized dining room that flows into the eat in kitchen. Make your way into the hallway to visit a full bathroom, 2 bedrooms & the owners suite w/half bath, recently updated. Next take the stairs down to a spacious finished lower level to find a large rec room, office space, playroom, storage & more! Off the kitchen is access to a large deck w/fenced in yard, shed & raised cedar garden beds. This home also has recent updates like a NEW roof, NEW seamless gutters, & NEW energy efficient windows. Also have the best of both world with this ideal location under 10 miles to State College and less than 5 miles Bellefonte w/ shopping & entertainment a stone's throw away. Call for more details today! Included: Refrigerator, Dishwasher, Range Hood, Range, Shed.